After a great first full year of brewing, we came to the conclusion that a bigger fermenter and a refrigerated brite tank will give us more options and flexibility, but more importantly…the ability to brew more beer! At one point last year, we came close to running completely out of beer. 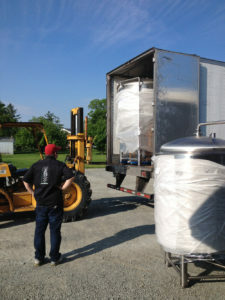 We only had three fermenters that were being filled and emptied as quickly as possible. 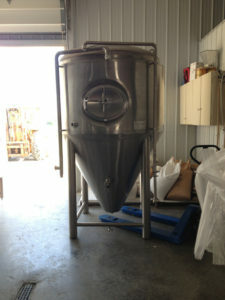 The addition of our popular lagers also began to hold up the fermenters, as lagers take longer to ferment. Ales and lagers are fermented with different types of yeast. The lager yeast strain we use takes about three to four weeks to complete fermentation, and the ale strains are usually done fermenting at one-and-a- half to two weeks. After fermentation, the beer is moved to the brite tanks where they finish settling and carbonate for a couple more weeks. Total time is typically six weeks for our lagers, and around four weeks for the ales. Some of our more popular beers are gone in under a month. So, inevitably we will run out of certain styles. The recent addition of the 15 barrel (465 gallon) fermenter, which is twice as big as our other fermenters, and a refrigerated brite tank will allow us to expand our keg accounts, start small runs of bottles, and help meet the demand for beer in our tap room. Thanks for all of the support!